QCS is the leading care industry expert in compliance, quality assurance and care management. The organisation supports registered social care, dental and GP services to deliver outstanding care through the provision of bespoke, service specific management systems that meets all ongoing regulatory requirements. CEO of QCS, Mat Whittingham, said: “We are really excited about this partnership to help care providers stay compliant. Over 2,700 dedicated pages are reviewed and updated regularly in line with legislative and regulatory requirements and best practice guidelines by our team of experts. “Furthermore, our compliance tools reflect the CQC`s changes to their Key Lines of Enquiries (KLOEs), enabling social care providers to stay up to date with current CQC thinking and inspection frameworks. NCF Executive Director, Vic Rayner, added: “Ensuring compliancy is probably one of the most time consuming aspects of running a care service for many of our members, and we are delighted to have partnered with QCS to help our members in this area. “Reducing the time spent on paperwork and using systems that make procedures more efficient will free up manager and staff time to do what they do best – that is supporting the people that use the service. 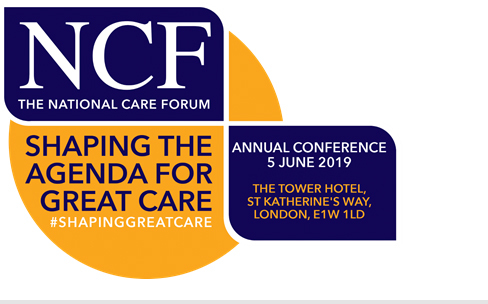 NCF members can meet their QCS counterparts at the NCF Annual Conference 2019 – ‘Shaping the Agenda for Great Care’ on 5 June at The Tower Hotel, London.